healthy heart recipes. What everybody tells you - lifestyle, exercise and diet are the keys to fighting heart diseases. What few people tell you - how to modify your diet to achieve it. What nobody tells you - tasty Healthy Heart Recipes to actually implement this! 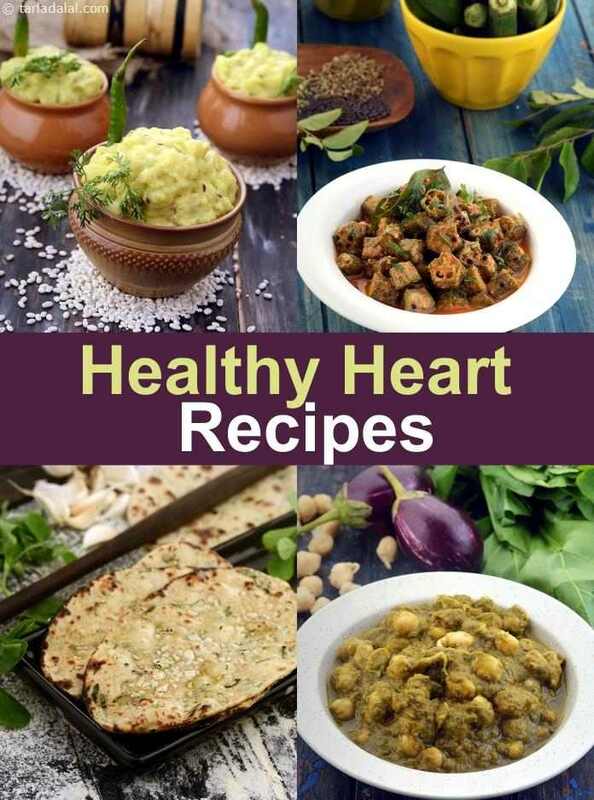 If you are looking to kick start a heart-healthy lifestyle, then this section is just perfect for you, packed with healthy heart recipes full of heart-friendly ingredients, made with smart cooking methods, using minimal fat and lots of whole grains. Firstly it is very important to know heart health supportive ingredients so that you can include them in your regular diet. 6. Nuts – Walnuts and Almonds Omega-3 fats, Oleic acid, Magnesium and Copper. Foods that need to be avoided for a healthy heart. To live a healthy life style you need to eat the right foods. Let’s start with eating whole grains like Jowar, Bajra, Oats and Barley. Full details are found on List of Best Grains and Cereals for Healthy Heart. Then you can choose the correct Legumes for a Healthy Heart. Choose from Moong, Rajma, Toovar Dal etc as these are rich in protein and help control the cholesterol levels. Combining cereals and legumes will not only make the recipe tasty but also will increase the nutritive value of it. Barley and Moong Dal Khichdi and Oats Idli are two perfect examples of how you can include this combination. Opt for low fat options like Low Fat Paneer, Low Fat Milk and Low Fat Curds as they are far healthier than the full fat version for those with Heart issues. Here is the logic for Low Fat Dairy Products Eat High Fibre Foods for a Healthy Heart Fruits like Apples, Oranges, Peaches etc. Eat Green Healthy Heart Vegetables like Broccoli, Spinach, Kale as they are low in Calories and high in Fibre. You can try our low fat recipes like Sprouts Dhokla and Dal Pandoli which are yummilicious steamed snacks with the goodness of green leafy vegetables. Soya Methi Garlic Naan is a unique recipe yet tasty, naans are often loaded with fat but this one is low in fat. Start your day with fibre rich breakfast like Quinoa Veg Upma, a healthy alternative to rava upma. Masala Karela where karela is combined with cauliflower and it beautifully masks the bitter taste of karela making it palatable even for kids. Chick Pea Mushroom and Barley Salad has an exciting texture and flavour, being fibre rich and also contains heart healthy ingredients like kabuli chana and barley. Have Bhaja Moong Dal Shobji Diye with Jowar Pyaz Ki Roti to make your meal charged with fibre. Read our article on Fiber for Healthy Heart to get a clearer picture on what all to include in your diet to make it fibre rich. From breakfast to dinner (and snacks in between) your entire day can be with healthy heart recipes. Enjoy our healthy heart articles below. Tarla Dalal Thank you for your kind words. We loved your suggestions.